Silk-screening is the process of spraying ceramic frit paint through a pre-designed screen to achieve a desired pattern. Trulite architectural screening enamels are used on various glass substrates and thicknesses, 1/8″ to 1/2″. The enamels are cured or fired into the glass during the tempering or heat strengthening cycle, reaching temperatures ranging from 1100° to 1350° F.
Trulite architectural screen printing patterns consist of holes, dots, stripes, gradients and many other custom designs. The printed glass products are used for decorations on buildings, office and room dividers, signs, phone booths, handrails and doors, shower doors, etc. Silk-screened products are available as an insulated unit, a monolithic lite, or a laminated piece of glass. 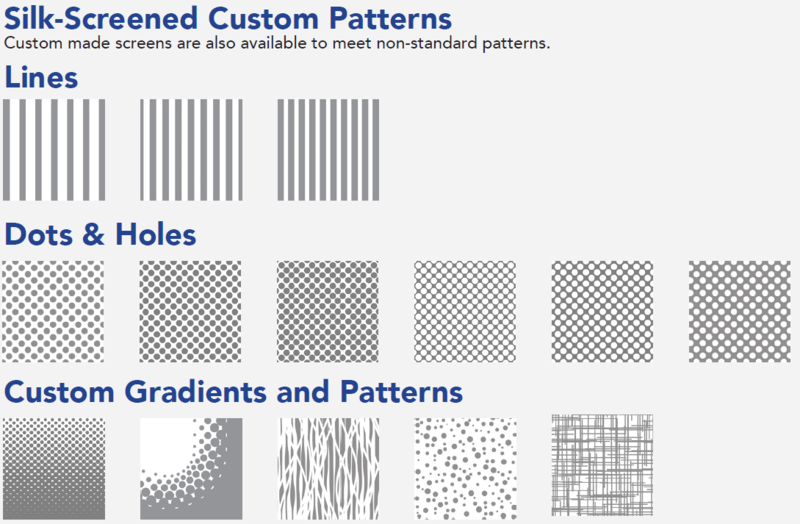 Silk-Screened Custom Patterns: Custom made screens are also available to meet non-standard patterns.